See our services page to find out what great services we have to offer! Siding Supply, Inc. is Middle Georgia's LEADING supply warehouse. With over 12,000 SQ FT of stock; our store offers a full line, and wide array of top quality exterior building products. Our dedicated & experienced staff can assist you with any size project - residential or commercial! 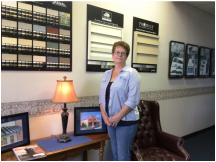 Whether you are a seasoned professional, or a " do-it-yourselfer," stop by for a visit to see why we have been chosen "The Best of the Best". We are conveniently located 2 miles from I-75, and a short drive from I-16. Since opening in 2003, we have expanded our product lines to include Windows, Columns, Cabinets, and Simulated Brick & Stone. We believe that providing professional & courteous Customer Service, and offering a variety of quality exterior products is what sets us apart. We also have the best Showroom in town, so stop by today and see what we have to offer! Conveniently located in Middle Georgia! We Support our Troops! Siding Supply, Inc. has recently supplied the materials for over 4,000 homes at Fort Benning Military Base in Columbus, GA. This is one of the largest projects of it's kind. See our Fort Benning page for details.